La casa Pandanus está llena de arte y amor diseñados para la familia. 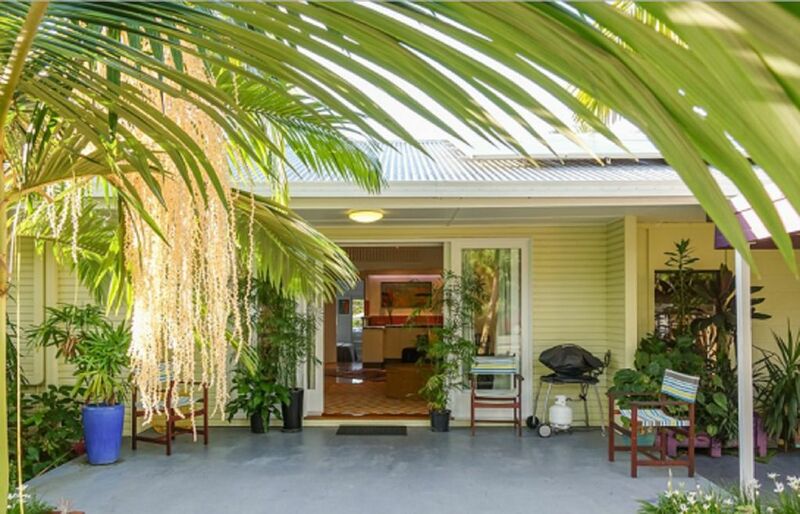 Este Queenslander grande, clásico, de una sola planta tiene cierta calidez debido a su combinación inusual de estilo moderno y retro que ofrece un hermoso alojamiento para hasta 6 personas. Marita ha restaurado amorosamente la Casa Pandanus, reflejando su propio estilo artístico, un poco bohemio pero definitivamente moderno, obras de arte originales adornan las paredes y ocasionalmente la casa se dobla como una galería de arte. Esta casa única ofrece conexión inalámbrica a internet gratuita, estacionamiento fuera de la calle, TV de pantalla plana grande, lavadora, aire acondicionado en todas las habitaciones y una cocina moderna bien equipada. Una característica real de Pandanus House se encuentra en los 3 dormitorios grandes, el dormitorio 1 con una cama King (que se puede dividir), el Dormitorio 2 con una cama Queen y el dormitorio 3 con dos camas individuales, hay privacidad y una sensación de retiro creado por El diseño y mejorado por los jardines muy bien cuidados. .
Si buscas un alojamiento relajado y confortable con los Jardines Botánicos, restaurantes y cafeterías a un par de minutos en coche, Pandanus House es donde querrás quedarte. durante sus vacaciones en Cairns. Cuarto de baño espacioso incluye gran ducha y bañera separadas. We enjoy our stay very much.the place is so convenient.beautifull surround the area.the owner very friendly.she gives us all useful tips. Thanks you very much Marita for having us stay in the house. Exactly as it looks ... and then some! So thrilled to pull up and walk through this lovely home - added the 'plus' to our reunion. Great location, great facilities, great hostess - VERY comfy beds and very clean. We stayed 7 nights at the well maintained Pandanus House and Gardenia Wing, accommodating all 8 of us very comfortably. The kitchen, laundry and pantry were all well equipped and adequately stocked. It was very convenient to have the push bikes as we could cycle to the nearby shops, cafés and botanic gardens. The children enjoyed the space and adults liked cooking on the weber barbecue! The house was perfectly located as it was close to the airport, local attractions and highways to explore Crystal Cascades and Atherton Tablelands. Thank you Marita, for having us at your property and for the good communication throughout our booking and staying process. Keep up your good efforts! The house is perfectly equipped for a large family stay. The rates are very good. We had a brilliant 14 days in Cairns and the fact we could return to this place to relax and chill out before the next adventure was fantastic. It provides real flexibility to your plans. Marita is a fine host who makes sure everything is ship shape and ready for you. Location is both quiet and on the other hand less than 10 minutes from pretty much everything in the city. I would highly recommend Pandanus house for a family holiday in Cairns. Amazing stay for a family to play! Our family had a fabulous time using this house as our home base for a week of fun in the sun. The house is well equipped, and the yard was great for our furry members. Will be back that's for sure! Davies Creek es un río rocoso cerca de Mareeba que es verdaderamente mágico para pasar el tiempo y relajarse.